JUSTICE MINISTER ALAN Shatter is once again being urged to apologise to Garda whistleblower Maurice McCabe and correct the Dáil record for suggesting he failed to co-operate with an internal inquiry into the penalty points controversy. 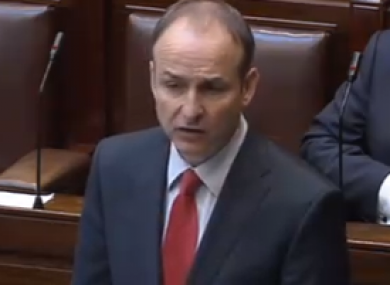 Fianna Fáil leader Micheál Martin said McCabe and his fellow whistleblowers had been “vindicated” by the Garda Inspectorate report on the issue. The document entitled ‘The Fixed Charge Processing System: A 21st Century Strategy’ will be presented to the Cabinet by Shatter this afternoon before it is published. At Leaders’ Questions, Martin told Taoiseach Enda Kenny that Shatter had “led the way in undermining” the whistleblowers. “The system tried to bury [their concerns] and the minister went along with that,” he said. Martin added that Shatter “finds it very difficult to apologise unequivocally apologise to anybody” but that he should “do the honourable thing”. Kenny refused to be drawn on whether or not Shatter, who was not in attendance, should apologise, but noted a “difference of opinion” between the Justice Minister and McCabe. He added that the government was “dealing with” the penalty points issue, something he said Fianna Fáil failed to do in the past. Kenny said recommendations from the report, which he admitted to not having seen, would lead to a “transparent” penalty points system that was “not subject to either celebrity or political interference”. Referencing Shatter’s response to the report yesterday, Martin said the minister should not have publicly commented on the report before the Cabinet had read it. He said this was “wrong in the context of the gravity of the report and the impact of the report”. Sinn Féin’s Caoimhghín Ó Caoláin reiterated Martin’s calls for Shatter to apologise to McCabe, saying Deputy Mick Wallace should also receive an apology as he too was “slighted in the house” by the minister. Ó Caoláin also questioned whether or not Garda Commissioner Martin Callinan’s position was tenable in light of the report, given his previous comments labelling whistleblowers as “disgusting”. Independent TD Stephen Donnelly said he would try to move the discussion on to some “better news”, referencing how AIB has written €150,000 off a mortgage and allowed the owners to stay in their family home. Donnelly said that “AIB are to be congratulated for what they’re doing”, but he went on to criticise the “inconsistency” of approach by banks dealing with mortgage arrears, singling out Bank of Ireland in particular. Donnelly called for a “system wide review” to look at how mortgage restructuring is handled. Kenny dismissed this idea, saying that the issue needed to be dealt with on a “case by case” basis. Email “'Do the honourable thing': Shatter told to apologise to Maurice McCabe”. Feedback on “'Do the honourable thing': Shatter told to apologise to Maurice McCabe”.